Of all the emerging technologies, blockchain is the least exciting as a technology, but potentially the most impactful on society. Blockchain doesn’t converse with you, it won’t 3D print your house or cut out your kidney stones with precision while the surgeon has a cup of tea. In terms of technology, it is about as exciting as relational databases. When you think of blockchain, you might think of Bitcoin. Bitcoin is a cryptocurrency that requires a maths degree to buy and ownership of a laptop that never crashes. Yet Bitcoin is just one of many different cryptocurrencies that uses blockchain as its core technology. And blockchain technology is also being used outside of financial services. What Is Blockchain and what is it’s value? Simply put, a blockchain is a decentralised database shared among a network of computers, all of which must approve an exchange before it can be recorded. Typically if we want to send someone some money, we would need a third party, like a bank to verify the exchange. The advantage of blockchain is that it stores an indelible ledger of all previous transactions in a string of ‘blocks’, meaning we know who owns what and who can send what to whom. Exchange digital assets without friction – a central ledger is no longer required which is why there is so much excitement in financial services. Transactions between people can happen nearly instantly without any third party. Execute smart contracts – documents can be stored electronically, and be verified as authentic. So we have unbreakable contracts. Store digital records – you can have an electronic ID and all sorts of information associated with it, your verified electronic profile. What are the real life uses of a blockchain? In an era where trust has been eroded in our institutions, politicians and even fellow citizens, anything that can strengthen trust should be viewed positively. In my article, The Quantified Workplace: Technology vs Trust, I commented that potentially intrusive technology will be introduced in the workplace, but only at the speed of employee trust. Given its practical attributes of storing digital records, executing smart contracts and as an efficient exchange, there are many real-life uses and experiments. This ranges from fixing broken business models e.g. Intellectual property in music to the more personal, recapturing our identities, so the ‘virtual you’ is actually owned by you. There are also examples of blockchain systems being developed to solve problems such as human trafficking, tracking blood diamonds and as a land register. As Don and Alex Tapscott argue in their book, “Blockchain Revolution”, blockchain could be the great economic leveller – a tool to strip out the middlemen from our economy and reward the makers and doers who truly create value. So there is definitely a group of political enthusiasts who see blockchain as transforming society. What’s the potential impact of blockchain on HR and people management? 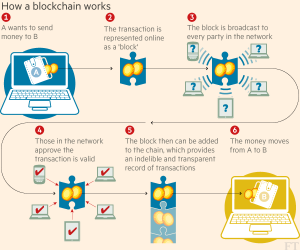 Given the practical attributes of blockchain promising to cut out middle-men and provide unbreakable contract, what might be the impact on people management, organisations and work? In Japan blockchain technology is being developed to create a prototype resume authentication database for job hunters with the aim of increasing transparency and in turn address fraudulent credentials. “With a resume authentication database, the verification of official certificates and contracts, which have until now been typically done on paper, could be carried out using the blockchain database” said Osamu Yonetani, CTO of Recruit Technologies. Imagine having all your employment related details associated with your electronic signature in one block :- security access, insurance, payroll, expenses, work performance, employment history, psychometrics etc. The employment contracting process would effectively be redundant. You could work almost immediately, with quick payment. The role of the recruiter will not be needed, but that’s the least of the disruption. 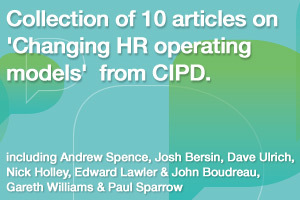 This raises questions about the nature of the employment contract and the ‘job’ itself. Most of us will then be in the gig economy, enabled by transparent contract and payment mechanisms. Chronobank.io, an Australian short-term work platform, is developing a Blockchain-based financial system for freelancers or contractors to obtain work and pay them in their own “labour-hour” token. They aim to disrupt the HR, finance and recruitment industries with their upcoming platform. I spoke with Sergei Sergienko CEO ChronoBank, who told me “Our goal is to make a difference in the way people find work and get rewarded for their labour, doing it decentralised and without the involvement of traditional financial institutions.” This is potentially transformative, and Sergei’s message to HR leaders was this change will happen, so find out more and work to develop this next wave for your organisation. As Gary Hamel has said, “our management structures are not suited for a digital age” In some cases, blockchain software will eliminate the need for many management functions. 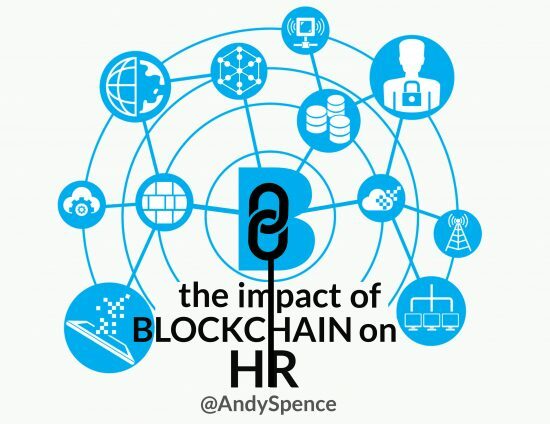 Which brings us back to the original question, what’s the potential impact of blockchain on HR and people management? Blockchain could fundamentally change how we manage people and HR, then the impact on HR is an irrelevant question if some of these predictions come true as we will have moved to very different economic models. I am looking forward to seeing how this develops, and in our field, and maybe seeing some #disruptHR start-ups pitching blockchain solutions at future HR Tech World conferences. Be great to hear from anyone out there developing blockchain models and technology in HR. This entry was posted on Monday, April 3rd, 2017 at 12:25 pm	and is filed under Future of Work, HCM, HR Blogs, HR Careers, HR SaaS, HR Strategy, HR Tech World, HR Technology, HR Tools, HR Transformation. You can follow any responses to this entry through the RSS 2.0 feed. You can trackback from your own site.